In what will no doubt go own in history as the world’s most adorable scientific study, scientists have uncovered the secrets of how koalas keep themselves cool in the sweltering Australian summer. The little marsupials have quite possibly the cutest method ever of cooling down, because when things get hot, they don’t pant or wallow in the mud like other animals. Instead, koalas just hug a tree. Normally a koala licks its limbs to cool down, but when temperatures really increase, what’s a koala to do? A team of Australian and American researchers looked at koalas at different temperatures and they found that as the heat climbed, koalas put more of their body surface in contact with a tree. But koalas aren’t just vying for the position of world’s cutest animal; scientifically there is a good reason for doing this. They are taking advantage of a process known as conductive heat transfer in which a warm object transfers its heat to a cooler object until both objects reach a similar temperature. Trees make the perfect object to cool down with because they stay cool by absorbing cooler ground water when the sun gets hot. Researchers published their findings in Royal Society’s Biology Letters after collaring 37 koalas and noting their posture, location and activity at different temperatures. 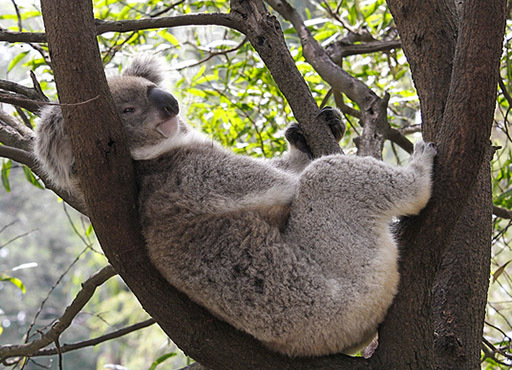 They noted that when things were hot, koalas sat lower in the trees, which scientists officially call “tree-hugging.” Researchers also noted that koalas prefer acacia to eucalyptus in the heat because acacia trees stay cooler. Kind of makes you want to pull up a tree and take a nap in the afternoon heat, doesn’t it? In what will no doubt go own in history as the world's most adorable scientific study, scientists have uncovered the secrets of how koalas keep themselves cool in the sweltering Australian summer. The little marsupials have quite possibly the cutest method ever of cooling down, because when things get hot, they don't pant or wallow in the mud like other animals. 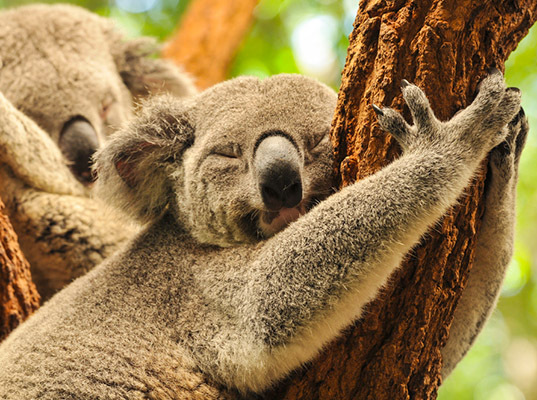 Instead, koalas just hug a tree.